Huawei on Tuesday unveiled the new FreeLace and FreeBuds Lite wireless headphonesas well as the Watch GT Active and Watch GT Elegant smartwatches. The Chinese telecommunications giant also announced its partnership with Korean fashion brand Gentle Monster to launch its lineup of smart eyewear. The first pair of Huawei smart glasses, which were showcased at the P30 launch event, are designed to let users make or receive voice calls and access the digital assistant. Additionally, the company showcased its 12000mAh 40W SuperCharge fast charging power bank that is designed to charge not just smartphones but also laptops. 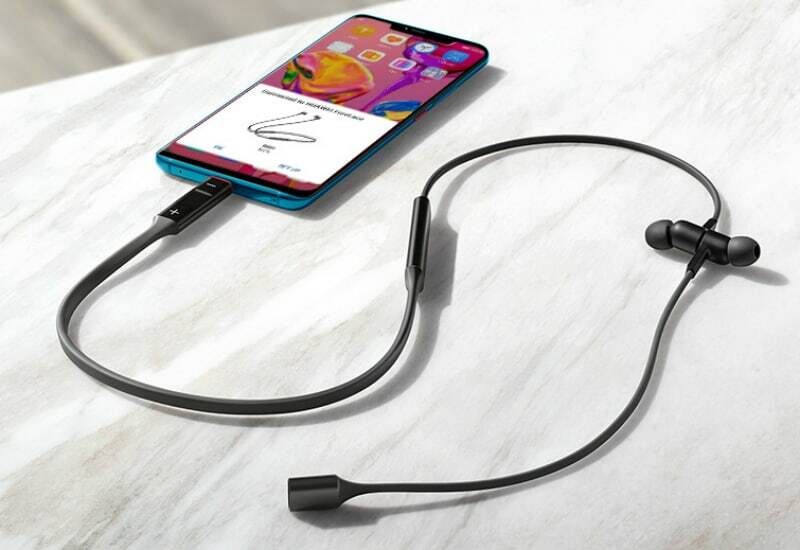 Talking about Huawei’s new devices, the Huawei FreeLace wireless headphones can easily be fast charged through any smartphone, tablet, or PC having a USB Type-C port. They feature a USB Type-C connector that joins the right earbud with its left counterpart. Huawei claims that the FreeLace headphones are capable of delivering up to 18 hours of playback or 13 hours of talk time on a single charge. Also, they can offer up to four hours of playback time with a five-minute of quick charge. Alongside fast charging, the Huawei FreeLace headphones support the company’s proprietary HiPair technology that helps enables quick and easy Bluetooth pairing with any Huawei phone running EMUI 9.1. The headphones come with 9.2mm dynamic driver units and have TPU diaphragm along with titanium plating on top. The company claims that this combination enables smooth treble and punchy bass. The microphone module of the Huawei FreeLace headphones has a dual-cavity design that comes with an additional channel for air ventilation. There is a Magnetic Switch as well as a built-in Hall sensor onboard. The in-line remote also enables volume adjustments and supports inputs such as a two-second-long press to activate the voice assistant and a double-tape to skip the current music track. Huawei has also provided IPX5 water and dust resistance on the FreeLace headphones. Additionally, you will get features such as dual-channel wind noise reduction and Bluetooth noise cancelling algorithm. The headphones also have Bluetooth v5.0 connectivity. The Huawei FreeLace headphones in Graphite Black, Amber Sunrise, Emerald Green, and Moonlight Silver colours will go on sale in select countries starting April 11. They will be offered with a price tag of EUR 99 (roughly Rs. 7,700). 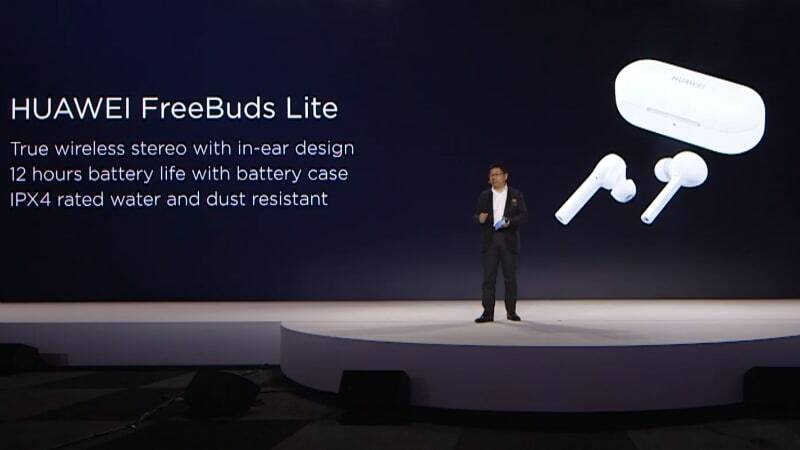 Huawei also unveiled the FreeBuds Lite earbuds on Tuesday. The new earbuds come with an AirPods-like design and pack IPX4-rated water/ dust resistant build. The company has also included features such as true wireless stereo audio along with an in-ear design and up to 12 hours of battery life through the available case. The Huawei FreeBuds Lite earbuds will go on sale with a price tag of EUR 119 (roughly Rs. 9,200). Huawei also announced a tie-up with Korean brand Gentle Monster at the event to build smart eyewear. The company showcased the first pair of smart glasses that have been developed as a part of this tie-up. The smart glasses, which don’t seem to have a marketing name right now, come with the ability to let users answer voice calls. There are dual microphones and speakers onboard to enable call-attending functionality. Also, the smart glasses are capable of accessing the voice assistant via the connected smartphone. The Huawei smart glasses pack IP67-rated water and dust resistant build. They can be charged wirelessly through their case or directly using the available USB Type-C port. The case for smart glasses notably has a 2,200mAh battery. Huawei didn’t announce the price of its smart glasses, though the company mentioned that they’ll come in a range of models sometime around July this year. Additionally, Huawei announced the expansion of its Watch GT lineup with the addition of the Active and Elegant Editions. While the Huawei Watch GT Active Edition comes with the same 46mm case size as the previous Watch GT Classic Edition and Sport Edition, the Watch GT Elegant Edition has a smaller 42mm case size. The Watch GT Active Edition comes with a 1.39-inch AMOLED HD display along with 454×454 pixels resolution. The Watch GT Elegant Edition, on the other hand, has a 1.2-inch AMOLED HD display with 390×390 pixels resolution. The Huawei Watch GT Active Edition and Elegant Edition both come with a Triathlon mode that enables tracking of open-water swimming, outdoor cycling, and outdoor running. Huawei claims that the proprietary mode will also be available on the existing Huawei Watch GT Classic and Sport Edition through a software update. To deliver a premium look and feel to users, the Huawei Watch GT Elegant Edition comes in Magic Pearl White and Tahitian Magic Black Pearl colour options. Similar to the previous Watch GT models, the Huawei Watch GT Active Edition is touted to offer two weeks of battery life on a single charge. It also comes with GPS, GLONASS, and GALILEO for precise location tracking. However, the Watch GT Elegant Edition comes with one week of battery life with heart rate monitoring turned on. The Huawei Watch GT Active Edition will go on sale at EUR 249 (roughly Rs. 19,300), while the Watch GT Elegant Edition will be offered at EUR 229 (roughly Rs. 17,800). Huawei also showcased the Band 3 that has a 0.95-inch AMOLED HD display and includes features such as real-time heart rate monitoring, swim stroke recognition, and scientific sleep monitoring. It will be available at EUR 59 (roughly Rs. 4,600). Huawei also brought its 12,000mAh 40W SuperCharge Power Bank that supports two-way fast charging along with 40W USB Type-C output. The power bank is capable of charging laptops through USB Type-C PD support. It is also touted to get charged in just two hours and 14 minutes using a 40W charger. The Huawei 12,000mAh 40W SuperCharge Power Bank has 12-Layer Comprehensive Safety Protection that is claimed to protect it from over current, over-power, and short circuit. Moreover, the power bank in White and Blue colour options will go on sale at EUR 99 (roughly Rs. 7,700). Huawei didn’t announce the India price and availability of the new devices.